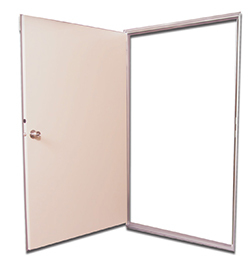 Elixir Door and Metals Company Series 200 Utility Doors are a great solution to utility door needs. They are available in both a single door and a double door. The Series 200 Utility Door is built from the same process as the Series 200 door with added features ensuring the usefulness of this unit for a utility door. The series is constructed from painted galvanized steel or pebble fiberglass and attached to a heavy-duty aluminum frame ensuring stability, safety, and security. The folded steel edge blocks air, light, and water. Other features include highly efficient polyurethane foam insulation with high R-Values and adjustable striker plates. In addition, our utility door features weather stripping on the door frame and door core creating a double seal. Additional options are available: chain, threshold, and a dripcap. We also offer this door as a capped fiberglass unit. Please be sure to ask about this exciting and durable option. 42" x 72" 46.5" x 72" 48" x 72"
42" x 76" 46.5" x 75" 48" x 76"
42" x 78" 46.5" x 76" 48" x 78"
10" x 10" Clear 18" x 20"
61" x 72" 65" x 72" 73" x 72"
61" x 74" 65" x 74" 73" x 74"
61" x 76" 65" x 76" 73" x 76"
61" x 78" 65" x 78" 73" x 78"
61" x 80" 65" x 80" 73" x 80"